These are products I am currently using for my hair. If you are a platinum blonde, you know how much maintenance and care needs to go into your hair. 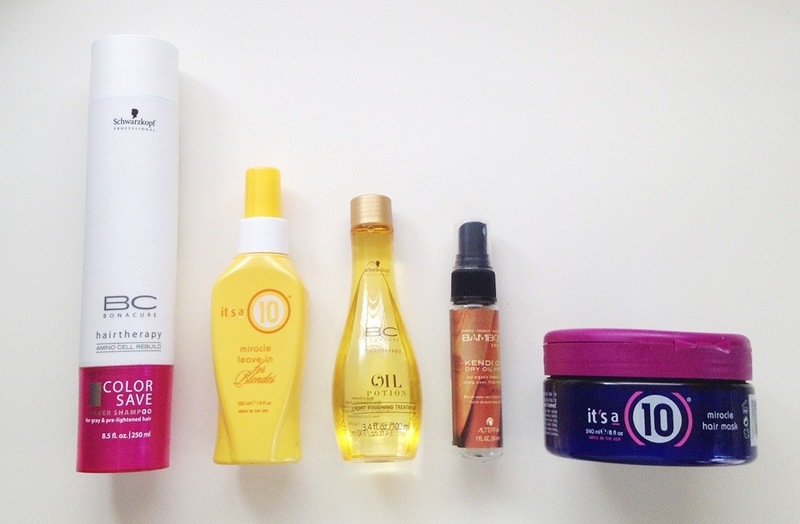 These are all products that keep blonde hair vibrant, healthy, toned, and shiny. I recommend these products for any blonde, not just platinum blondes. The first product is Schwarzkopf’s Color Save Silver (purple) Shampoo ($18). It takes the brass color out of hair and keeps the color vibrant, toned and fresh looking. I leave it in for 5 minutes to keep my hair really white. The second product is a spray leave-in conditioner/ toner called “It’s a 10” for blondes ($16). It tones, adds shine, detangles, and has a UV protectant. I definitely recommend using this on wet hair right when you get out if the shower. If you use it on dry hair or use too much, your hair will turn a little lavender 🙂 The next product is an Oil Potion Light Finishing Treatment ($38) from Schwarzkopf. I love using this on wet or dry hair. It keeps it super soft and silky feeling and it also de-frizzes. The next product is from Alterna and it’s part of the Bamboo line. It’s the Kendi Dry Oil Mist ($22). I love spraying this on when I get out of the shower but I mostly use it throughout the day to add shine and softness to my hair. And last but not least is my hair mask from It’s a 10 ($29). The longer you leave this product in, the better. You can use it as your conditioner or leave it in for 15 minutes and rinse it out. Your hair will feel so silky and soft after you use this product and it will also prevent breakage. Plus it smells amazing! All of these products I found at local hair salons but some of them you can find at Sephora or Target.